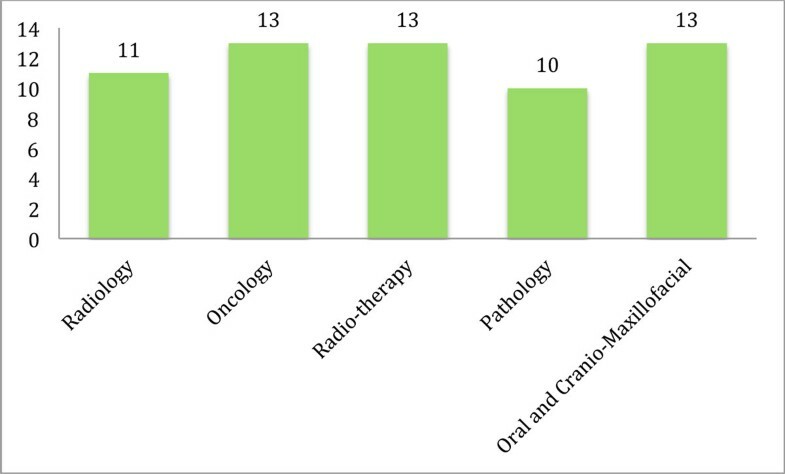 Multidisciplinary Cancer Conferences are established in several medical fields since decades  and the number of itself and discussed cases rises . In Cranio-Maxillofacial Surgery the diagnosis and treatment of cancer is one main focus. All over the world there is an increase of the incidence rate of oral cancer registered . Furthermore tumours of different entities of the head and face are treated in this specialist medical area. Therefore it is necessary to focus on a frictionless treatment without time loss by involving various medical specialists. Any communication in Multidisciplinary Cancer Conferences is the first step toward a successful therapy. The Cranio-Maxillofacial Surgery Multidisciplinary Cancer Conference takes places in a 14-day interval. The number of discussed cases and the participation of the multidisciplinary team was evaluated from 2012 till 2014. Discussed cancer cases continuously increased over time. In 2014 when compared to 2013 an increase of 88 percent was apparent. The attendance of required disciplines was only documented in 50 percent of cases. The departments of Oncology, Radiotherapy and Cranio-Maxillofacial Surgery participated in 100 percent in the documented Cancer Conferences. Attendance of the different disciplines in 2014 of 13 attendance documented conferences. Because of increasing cancer cases it is important to have a Multidisciplinary Cancer Conference. The evaluation show that only a continuously and well documented Conference is the only option to treat patients interdisciplinary. Valuable time in cancer therapy must not be delayed. As a result of the fusion with the ENT Cancer Conference the new Multidisciplinary Cancer Conferences can take place weekly since June 2015. A standardised discussion seems to be the most important factor to secure the quality level.